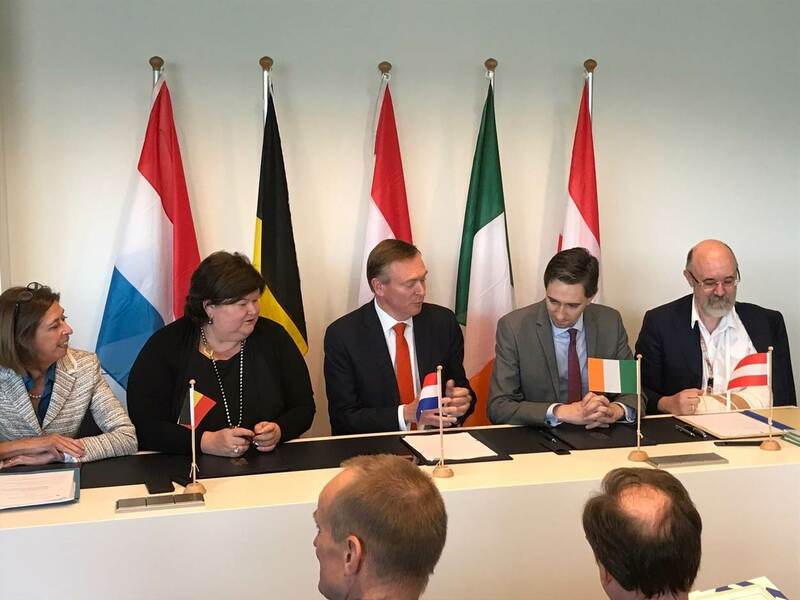 Today, the Irish Minister for Health, Simon Harris signed an Agreement with his colleagues from Belgium, The Netherlands, Luxembourg and Austria to join the Beneluxa Initiative on Pharmaceutical Policy. The ceremony took place during the Employment, Social Policy, Health and Consumer Affairs Council (EPSCO) in Luxembourg. Ireland is the fifth country to join the collaborative alliance on pharmaceutical policy. Minister Harris stated: “I am pleased that my Ministerial colleagues from Austria, Belgium, The Netherlands and Luxembourg have enabled Ireland to join this exciting, international collaboration on drug pricing and supply. I want the newest and most innovative medicines to be available in a timely manner to all our citizens. This collaboration will assist us in doing just that by ensuring that medicines can be sourced at a price that is affordable and sustainable in the context of the ever competing demands for resources rights across our health service”. The BeNeLuxA Ministers responsible for pharmaceutical policy welcomed Ireland joining and participating in the collaboration. Dutch minister Bruno Bruins for Medical care said: “Ireland is a great addition to the Beneluxa family. All five countries face similar issues regarding access and affordability to new and innovative medicines. By joining forces we improve our mutual position in price negotiations towards the pharmaceutical industry and we have a stronger voice at European level. In this way we can ensure that our patients can count on access to affordable, innovative medicines in the long term”. Belgian minister Maggie De Block of Social Affairs and Public Health said: "Four years ago, each country still worked on its own. Today, we are five countries joining forces, our objective being to offer the best care possible, as soon as possible and in a sustainable way to all our patients. I hope that other European countries will join us soon. Because the more patients we represent, the more our voice will be heard when discussing high-cost innovative medicines". In 2015 the Beneluxa cooperation was initiated aiming for sustainable access to, and appropriate use of, medicines in the participating countries. Together, the countries want to enhance patients’ access to high quality and affordable pharmaceutical treatments. The cooperation is not limited to joint pricing negotiations. The coalition also works together closely on a horizon scanning, to explore which innovative – often extremely expensive – medicines are expected to reach the market in the near future. In addition, the Beneluxa partners conduct joint health technology assessments and share data and policies. The collaboration recently introduced the international horizon scanning initiative (IHSI), that goes beyond the current coalition of countries. Its goal is to build a permanent horizon scanning system that can support countries and institutions in policy planning and their decision making regarding the reimbursement of new pharmaceuticals. A wide group of countries is currently invested in developing the IHSI further. Irish Minister for Health, Simon Harris, signing the Agreement to join the Beneluxa Initiative on Pharmaceutical Policy.